. More information on the merchandise (including clothing sizing charts) can be found on the merchandise page. The registration form allows you optionally select one of all the merchandise on offer. If you would like additional items, please fill in the extra’s order form. Thanks to Dave Midgley, Fran Gramowski and the rest of the NABSA guys who have really stepped up to the plate and have the venue permits and accommodation nailed down. From the tent to toilet hire the job is all done… Sorry about the pun! There are no more big issues to iron out so the organizing team only has to turn up and make sure the last of the boxes are ticked….Well done guys. As we are all aware there is more than a little bit of work to do when leading up to a major event, especially when executing plans from a distance. You will see the event fees are broken down for clarity, and all costs covered from BLM fees and timing gear included. If you are unclear please let us know. 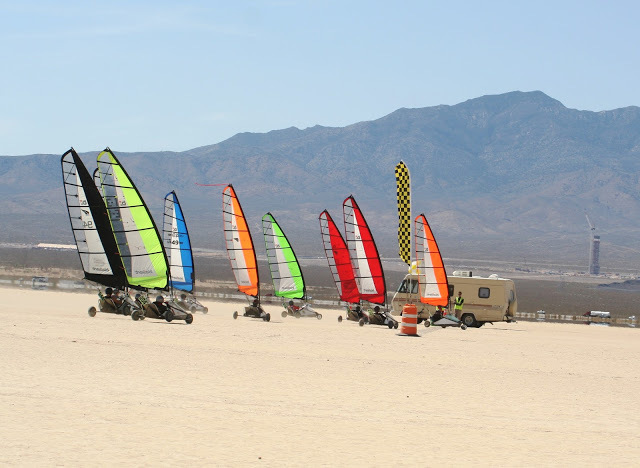 The Worlds organizing team can assure those planning on coming over to Ivanpah that they will be part of an awesome celebration of all things blokart, with some of the best people on the planet on one of the best pieces of desert in the world. Ivanpah can turn on some pretty radical conditions but it is mostly a surreal experience when we strike settled weather and the sailing can be from sublime to scary to say the least. I am sure this event will be one not to be forgotten. There will be more life long memories and great relationships forged between pilots from all over the world, so the best will only be, if you turn up and see…. There is going to be plenty of time for talking over the days events at the happy hour every evening for those who want to hang around before heading off to your air-conditioned apartments or staying over on the playa with the local guys and girls This is possibly the last opportunity for the blokart worlds to be held at Ivanpah because rumour has it is being developed for other purposes. (shame about the turtles!) There are brilliant places to visit in the region and world class shows and entertainment in Vegas which is a short drive away from Primm Resort. So bring your family, friends and supporters along to share a great time of sailing at an amazing venue with great people and if you manage to get a placing in your division that will be a bonus. Winning is not the placing you get, it is more about getting to the place! Safe travels to you all and bring the grin!